Israel, 2013, 102 minutes, Colour. 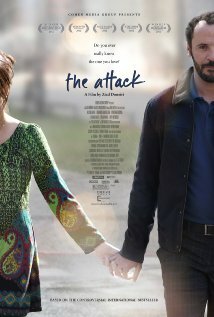 The Attack is a provocative film, coming from Israel but showing the situation between Israel and Palestine, the possibilities of working together, the reality of suicide bombers and the consequences for both sides. A Palestinian doctor, working at a Tel Aviv hospital, is given an award. His wife cannot be present but he speaks to her on the phone. She has allegedly travelled north to visit family. The suicide bomber attacks an Israeli target, killing a number of people. The doctor and the staff tend the victims. It emerges that the doctor’s wife is amongst dead and it soon becomes clear that she is the suicide bomber. The doctor is taken, interrogated, under suspicion despite his reputation. After being released, he travels to the north, questioning the family, questioning contacts and finally realises that it is the truth, and is amazed and angry that his wife would this from him. The film was well acted, dramatic in its presentation of the suicide bombing situation and the consequences. And, as always, it raises questions of whether they can be independent record between Palestine and Israel, or the possibility of a Palestinian state. 1. The title, its tone? In the Israel- Palestine conflict? 2. The work of the director, in Israel, his experience in the United States? His perspective on characters, on the issues? Presenting both sides? 3. The locations, Tel Aviv, the auditorium and reception, the hospital, the bomb situation, homes, interrogations, the visit to the West Bank, locations and people? Musical score? 4. The story from Amin’s point of view? Living in Tel Aviv, his Israeli friends, accepted, his work in hospital, his long career, surgeon, receiving the award, the acclaim, his speech? The brief phone call from his wife, its later being used against him? 5. The terrorist bombing, the dead, his working in the hospital? News that his wife was amongst the dead? His not understanding, the explanation that she was away from the city? Reactions against him, Israelis not wanting him to operate on them? 6. Shin Bat and his being taken, the interrogations, the severity, hostility, his bewilderment, denials? The emerging facts? The phone call, his wife’s lies? The flashbacks and his memories? 7. Reaction from his colleagues, the sympathetic colleague and the visits, her support? 8. Hostility in Israel, from Palestinians, the trashing of his house? 9. The evidence, his coming to believe the truth about his wife? His puzzlement? 10. His decision to go to find out for himself, going to her relatives, the explanations, the relative who came after the bombing to ask for money, his wife’s links to the terrorists? The range of people in the West Bank and their comments, some hostility, fearing that he was an agent of the Israelis, suspicious? The psychological effect on him? Emotional? 11. The message from his wife, her loving him, her explanations, and the motivation for the action? 12. Insight into the mentality and activities of suicide bombers? 13. The film banned by the Arab League and the condemnations of right-wing Israelis?